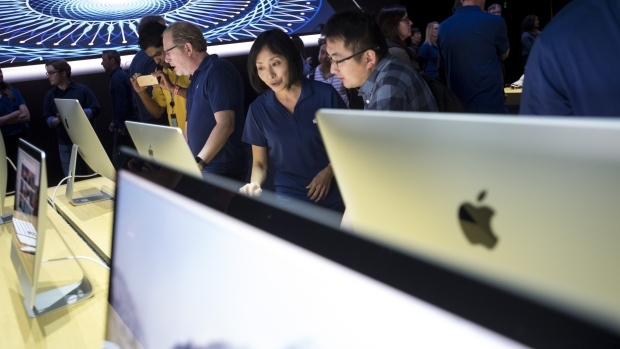 Attendees look at the new Apple Inc. iMac Pro desktop computers during the Apple Worldwide Developers Conference (WWDC) in San Jose, California, U.S., on Monday, June 5, 2017. Apple Inc. (AAPL.O) introduced the first update to its iMac all-in-one desktop computer since mid-2017, continuing a hardware blitz ahead of a highly anticipated event March 25 to unveil new media and entertainment services. The new iMacs are Apple’s second product launch this week, following the new iPad Air and iPad mini introduction on Monday. Apple’s shares were little changed at US$188.91 at 9:36 a.m. in New York.